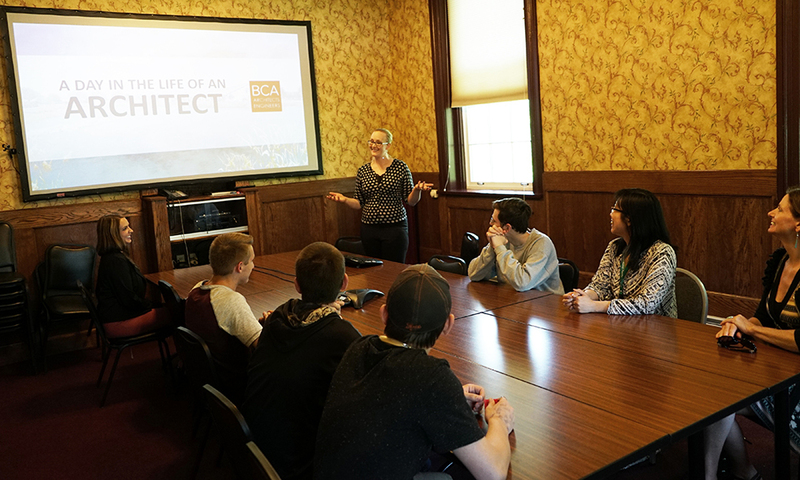 Students in the 3D Modeling & Design program at the Bohlen Technical Center recently learned the career options available to them through a visit with BCA Architects and Engineers in Watertown. The company, formerly known as Bernier, Carr, & Associates, gave students a tour of their facility and explained the history of the company. Students also had a chance to meet with staff, including Mike Mitchell, who was a 2002 graduate of the same program at Jefferson-Lewis BOCES. Kristen Aten-Schell, Project Architect and LEED Engineer, explained that the company does most of its work in renovation of existing buildings and that many projects require a team effort to complete. Students were also given a formal presentation that went through the day in the life of an architect, different projects that are undertaken, the types of careers that are available with an architectural degree, and the education requirements needed for the degree. The class was also given a sneak peek into an upcoming project BCA is working on for local client. Aten-Schell says the company is always on the lookout for local talent and offers internships to students who are studying architecture and are looking to enter into it as a career. Abagayle DeBuck-Earl, a 2018 graduate of the 3D Modeling & Design program from Sackets Harbor Central School, spent part of her senior year working part time at BCA. Aten-Schell says partnerships between companies like 3D Modeling & Design and local employers are important. For those looking for a career in architecture, 3D Modeling & Design is a perfect opportunity to begin studies in the field. To learn more about the program offered at Jefferson-Lewis BOCES, click here.